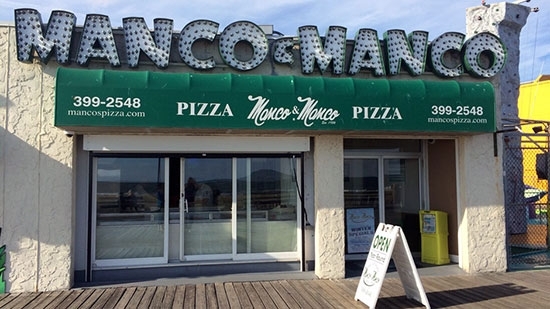 The owners of Ocean City, NJ's landmark Manco & Manco pizza shops were sentenced today in federal court after pleading guilty to tax evasion charges in 2015. 57-year-old Charles Bangle of Somers Point admitted to evading nearly $92,000 in taxes. He was sentenced to 15 months in prison. His wife, 54-year-old Mary Bangle, was given three months probation for lying to the IRS. They will also owe restitution. The federal courtroom in Camden, NJ, was full of supporters willing to testify on behalf of the Bangles and ask for leniency. Charles faced up to 24 months in prison. The judge acknowledged the support but said the crime was serious and deterrence was necessary. He did grant their attorney's request to have the sentence begin in September, after the busy summer season. Bangle under reported income at his three pizza businesses (two on the Ocean City boardwalk, one in Somers Point) and would hide bags of cash under the pizza boxes. He'd deposit the cash in the bank later in small amounts to avoid detection. Philadelphia Police are investigating the suspicious death of a 57-year-old woman in the city's Port Richmond section on Friday afternoon. Just after 4 p.m., the woman was found unresponsive by her son in the living room of her home on the 3200 block of Mercer Street. She was pronounced dead by medics shortly after. She had been beaten and suffered blunt force trauma to the head. According to investigators, the second floor had been ransacked and the family said some items are missing. Police are looking into possible surveillance footage. No arrests have been made. A 2-alarm fire tore through the Ramada Inn in Vineland, NJ, early Friday morning. It started around 2 a.m. at the hotel on the 2200 block of West Landis Avenue. It took firefighters two and a half hours to get the fire under control. One police officer was hospitalized for smoke inhalation and one hotel guest was also injured. Firefighters believe the fire started in a room on the second floor. Officers went room by room knocking to tell people to get out. Many guests on the second floor tried to jump or climb out their windows to escape and had to be rescued. 28 guests were displaced and relocated to other hotels. The rest of the hotel will remain open.